Chris — Geeks on Tour is member supported. This FREE newsletter is made possible by our paid (Premium) members. Member benefits include access to over 500 tutorial videos, asking questions on ‘Ask the Geeks’ forum, Show Notes for our weekly show, “What Does This Button Do?” and all our eBooks including Mrs Geek’s Guide to Google Photos. In the beginning of May we joined a group of scuba divers from USA Dive Club and went to Bimini, Bahamas for a long weekend of diving. Then it was time to pack the camper and start our summer tour of RV rallies. Driving 1,400 miles in 3 days took us from home in Fort Lauderdale, Florida to the Escapade rally in Sedalia, MO. 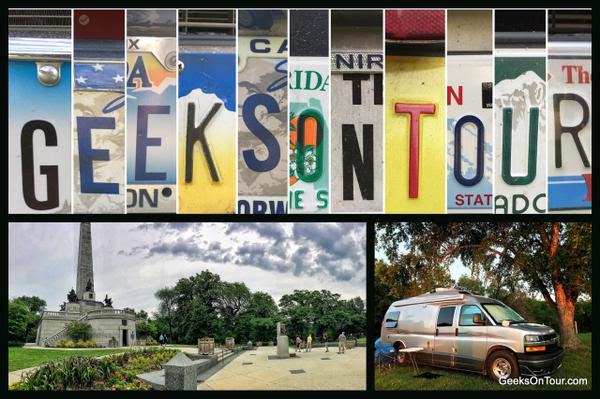 There we taught a 2-day hands-on smartphone photography class where one of our students, Mike McIlraith, made the license plate collage you see above. Isn’t that cool?! Thanks Mike! See our May photo album for more pictures, and our Blog for the rest of the story. We’re on our way to Michigan for the FMCA GLAMA Rally. We just left Sedalia, MO and a wonderful Escapade. We also like to park where there are no hookups. In this article, we share a bit about what our life is like as we travel, and work on the road in our completely self-contained camper van.